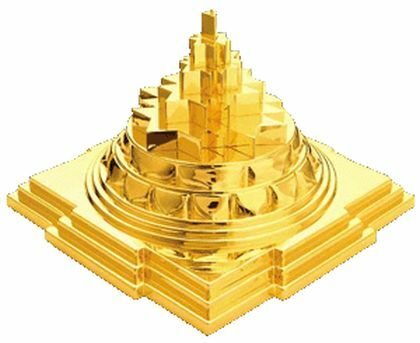 The Sri Yantra (“sacred instrument“) or Sri Chakra (“sacred wheel“) or Mahameru [3D] is a yantra (instrument or machine) formed by nine interlocking triangles that surround and radiate out from the central (bindu) point, the junction point between the physical universe and its unmanifest source. 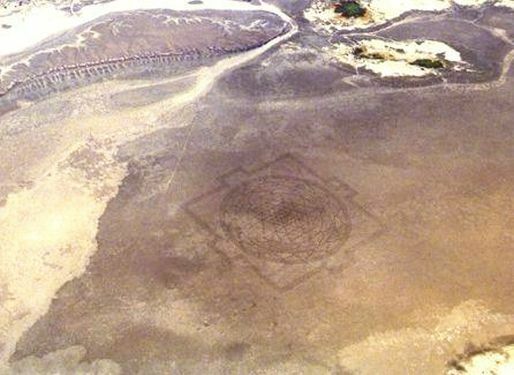 On August 10, 1990, Bill Miller, a pilot in the Idaho Air National Guard, noticed a huge etching on a dried-up lake-bed while flying over it, in Oregon State of the United States. The massive formation was a quarter of a mile in width and was etched 3 inches deep into the surface. In his earlier round about 30 minutes before Miller first noticed the glyph, there had been no trace of this formation. Neither had any of the other pilots of the Idaho National Guard (who regularly train over this corridor), observed any unusual activity or a design-in-process in this area. The etching simply appeared that morning. There was no possibility of any of the other pilots having missed such a prominent formation in process of being made. The formation detected on the morning of August 10, 1990 was oriented precisely in the North-South direction. The glyph had a machine like precision in its shape and clarity of lines. After Bill Miller reported the observation, the news was concealed from the public by the authorities for thirty days. By September 14th, the story was picked up by the Associated Press, Bend Bulletin and the Oregonian. 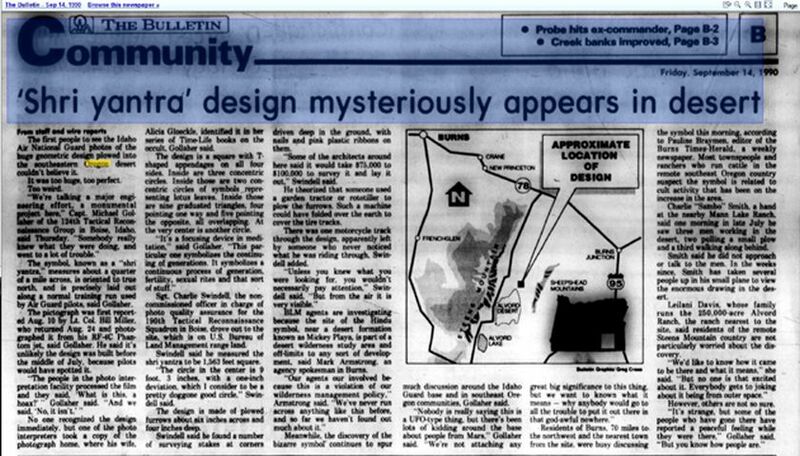 The Oregonian reported that some architects that had been contacted by the newspaper, had said that the cost of conducting a land survey alone, before such a project could be initiated, would range from 75,000 to 100,000 dollars. The Sri Yantra design has a degree of complexity and a level of symmetry that makes it difficult to recreate its design even on paper, let alone furrow an enormous replication of it on a dry lake-bed. There was therefore a good deal of speculation that the glyph was not man-made. 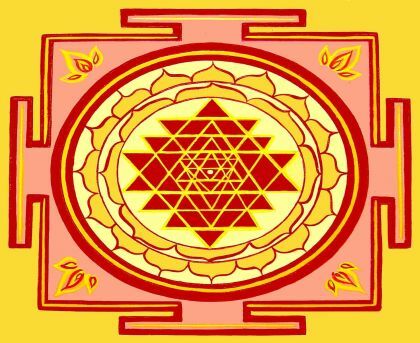 The Sri Yantra is variedly described as a visual representation of the sound ‘Om’ and an expression of the philosophy of ‘Advaita (one-ness or non-duality)‘. The Sri Yantra is popularly used today in India as a meditation device.